This is one of the flowers in my wild flowers mixed box! I love the yellow petals with maroon center. It has a delicate stem and continuously blooms throughout the summer. 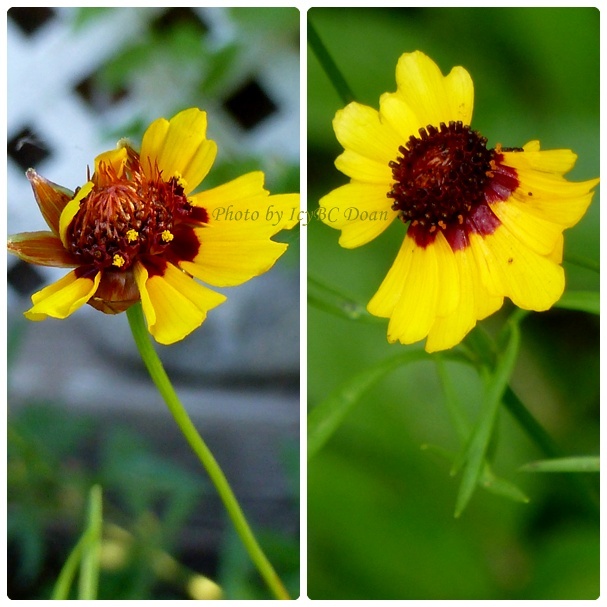 Though this coreopsis tinctoria is an annual flower, it will self sow and easy to grow. I can't find a common or popular name for it. As I have mentioned before in my "Gardening On a Dollar", I just spreaded the seeds and watered them until the plants began to grow. I think I planted it too late in the season, but with the strange weather we had this year, I have no choice. My coreopsis tinctoria flowers are small in sizes, but haven't stopped blooming since. I have this in my flower garden too and I remember I sow the seeds from the box ($1) last year but it came this year. One of my favorite to photograph too it looks like this flower is very photogenic hehehe. It is beautiful I hope it will multiply well for you. i love the vibrant colors. thanks for sharing your gardening joy.